Azerbaijani athletes won 66 gold, 39 silver and 29 bronze medals. Turkey is the second with 65 gold medals, 58 silver and 49 bronze medals. 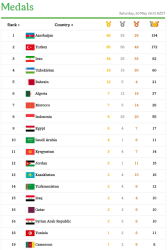 Iran is the third with 24 gold, 25 silver and 33 bronze medals.